Habit: Annual to shrub, +- gland-dotted, scented. Leaf: entire to serrate, margin flat or wavy; petioles 0 or present, often grading into blade. Inflorescence: flowers in compact clusters of >= 1 per main stem, these occasionally arrayed in panicles (rarely spikes); flowers 3--100 per cluster; bracts generally erect in a cup-like involucre or reflexed, reduced in size inward, leaf-like to membranous in texture, green or straw-colored to rose or purple, linear to ovate, acuminate to acute or obtuse. Flower: calyx 5-lobed; 4--25 mm; corolla white to purple or yellow to red, weakly bilateral, upper lip erect, 2-lobed, lower lip recurved, 3-lobed; stamens 4; style unequally 2-lobed. Species In Genus: > 30 species: western North America. Etymology: (Latin: small Monarda) Note: Complex; study needed; many taxa intergrade; flower cluster width and bract orientation given for pressed specimens. Leaf length including petiole, if present. M. Brunell authored Monardella follettii (in part), Monardella odoratissima (in part), Monardella palmeri, Monardella purpurea, Monardella sheltonii (in part), Monardella stebbinsii, Monardella villosa (in part). Habit: Subshrub, erect, silvery to ash-gray; hairs dense, uniform, recurved. Stem: 15--60 cm, few to many from base. Leaf: decurrent or sessile to petioled, 10--35 mm, 2--10 mm wide, linear to narrowly (ob)ovate, entire, +- green, silvery, or ash-gray. Inflorescence: flower clusters 1--several per main stem 7--30 mm wide; bracts 6--25 mm, 2--14 mm wide, papery, narrowly elliptic to ovate, obtuse-acuminate to acute, ciliate, hairy, +- white or straw-colored to pink, rose or purple. Flower: calyx lobes stiff-hairy; corolla 10--15 mm, +- white or light blue to purple; stamens exserted. Habit: Silvery. Stem: few to several, 18--50 cm, densely puberulent. Leaf: 10--25 mm, 2--4 mm wide, linear to narrowly lanceolate. Inflorescence: flower cluster 1(3) per main stem, 10--22 mm wide; bracts 10--15 mm, 5--12 mm wide, exceeding calyx, broadly lanceolate to ovate, white to rose, sparsely short-ciliate. Flower: calyx 8--9 mm, puberulent; corolla 10--14 mm, lavender to light blue. Ecology: Chaparral, montane woodland; coarse soils; Elevation: 900--2000 m. Bioregional Distribution: PR, sw DMtns (Little San Bernardino Mtns), s DMoj; Distribution Outside California: northern Baja California. Flowering Time: Jun--Sep Note: Plants in Pioneertown and Morongo/Yucca Valley have +- longer hairs, included here, may be undescribed taxon; warrants further study. Citation for this treatment: Andrew C. Sanders, Mark A. Elvin & Mark S. Brunell 2012, Monardella linoides subsp. 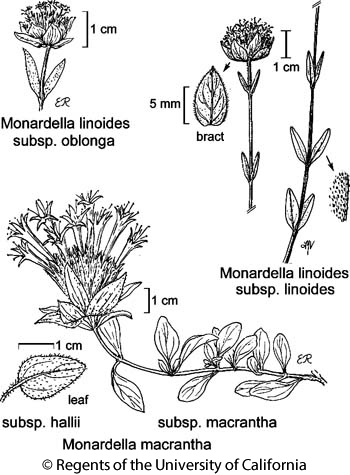 linoides, in Jepson Flora Project (eds.) Jepson eFlora, http://ucjeps.berkeley.edu/eflora/eflora_display.php?tid=51606, accessed on April 24, 2019. PR, sw DMtns (Little San Bernardino Mtns), s DMoj; Markers link to CCH specimen records. Yellow markers indicate records that may provide evidence for eFlora range revision or may have georeferencing or identification issues. Purple markers indicate specimens collected from a garden, greenhouse, or other non-wild location.